There you go, a bit of powershell script that shows a graphical user interface… Not elegant, but possible. you need to give the remote user elevated rights to get authorization. Cannot serialize member because it implements IDictionary. If you ever get an error like Cannot serialize member x of type T, because it implements IDictionary. or something similar whenever you try to return an serialize object with xmlserializer. Note: This isn’t suitable for webservice use, since the schema is lost. Then, instead of returning T, returns XmlSerializable<T>, and the client accesses the RawObject member of this class to read the return value. This sets all builds to a status of cancelled. Or if you prefer, do a select from tbl_buildQueue, and find any one that has a status of 1 (in progress) or 2 (Queueud). I spotted that over the last two weeks my conversion rate had dropped from 21% to 18%, meaning that on average 3% less people were actually using my website after they came to it. For me, conversion rate either stayed within a +/- 1% range unless the site crashed completely, when it would drop to 0%. A slow decline in conversion rate was very unusual. Note that conversion rates have nothing to do with visitor numbers, so whether this applied to 100 ot 1,000 users, it’s always the same. One thing that had happened about a month ago, was that my Users database exceded the 4GB limit of SQL express, and was unfortunately lost in a failed backup-restore procedure, the new Users database was hastily constructed to get the site back up and running quickly. At the start, no problems occurred, but since there is now 1.3 Million rows in the users table, lookups became increasingly slow. A single update took 10 seconds to complete, and the front page performs one update, therefore slowing the front page by 10 seconds. To my mind, 10 seconds is too long to wait for a web page, and 3% of people must have got tired, and left the site before using it. Sped up the update from 10 seconds to under 1 second, and the front page now loads in 1.09 seconds, rather than 10. The following day, conversion rates have risen back to 21.63%, the second-highest all month, and recorded traffic increased by 500 users. 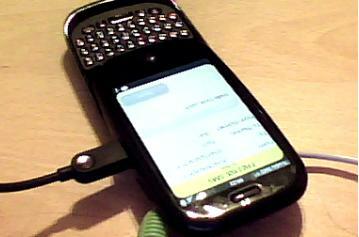 Which allows you run apps direct from Palm ares to the palm pre via a USB cable.